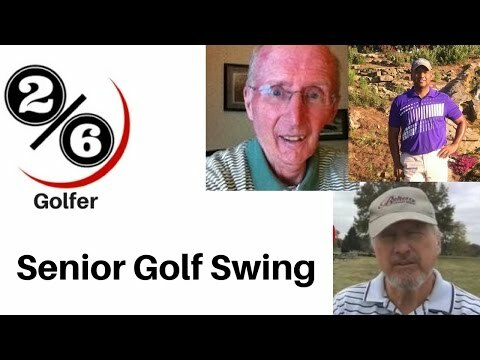 In this video Terry explains how the senior golf swing can get plenty of power. If your a senior golfer and you thought it was impossible to get crazy power in your golf swing take a look at the video above. The first thing you need to realize as any golfer is the way to power is not to sway off the golf ball. Just like all scratch golfers swinging around your spine is the easiest way to get the most power out or your golf swing. And just because it maybe a 3/4 swing does not mean you cannot get a good shoulder turn. One of the keys to getting shoulder turn is to bend the left knee twards the right knee as you reach the top of the backswing. And when you put the club on plane and make the swing as efficient as possible you can get just as much compression as you need to hit solid long golf shots. At impact I want my head to stay behind the ball on my right knee. The right knee is a good body marker for your head position. Staying on plane means to take the club away by keeping the club head outside your hands until the club shaft reaches parellel. And when the club comes back down to impact it will be in front of your body for perfect contact.